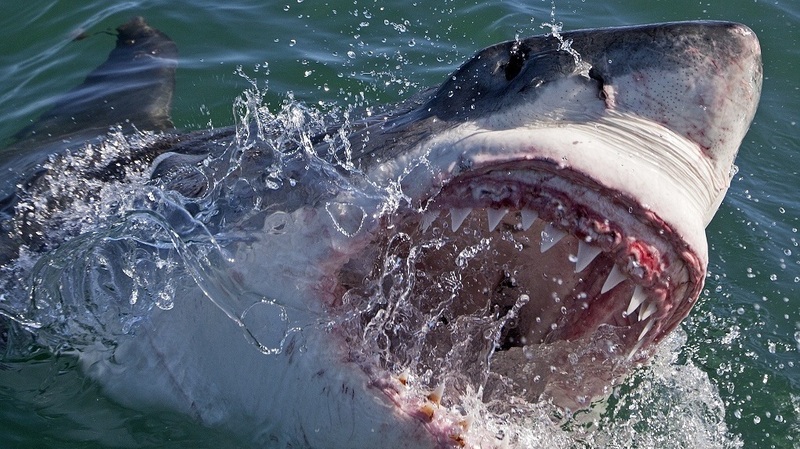 Broken Teeth And Fake-umentaries: Another Shark Week Gone By Alastair Bland looks at the dangers to real sharks and the hazards of pseudo-documentaries as another Shark Week draws to a close. A great white shark — one of many you'll see on Discovery's Shark Week. A great white attacks a submersible "SharkCam" deployed by the Woods Hole Oceanographic Institution, shattering its teeth on the metal biteproof cylinder. Off Baja California, the crew of a research boat feeds a single great white 400 pounds of tuna in a boyish science test to see how much one shark can eat. A TV crew travels to New Zealand on a campy expedition to document a mythical giant shark. A commercial fishing vessel drops its nets into thousands of feet of water to catch rare "alien sharks." This is just some of the stuff of Discovery Channel's Shark Week, which just wrapped its 27th rendition. The hit summer series was once observed with some respect by serious members of the scientific community. Through the decades, however, it has devolved into a B-movie-style blend of fiction, bad acting, a few facts and potential injuries to sharks. In some of the shows, real scientists are featured onboard real research vessels at sea. However, their chief priority, beneath flimsy scientific premises, seems always to be landing sweet video footage of sharks biting stuff. Shark Week first aired in 1988. "As late as 1995 and 1996, it was almost exclusively about conservation and exploration," says Sean van Sommeran, founder of the Pelagic Shark Research Foundation in Santa Cruz. "Now, it's big game trophy fishing, extreme sports diving and science fiction monster sharks that sink ships in the night. The science highlighted is wildly speculative and harmful." One of the underlying problems with Shark Week, van Sommeran says, is a basic failure to understand sharks as real wild animals. "Sharks aren't from Mars, they're wildlife, and one of the most basic tenets of wildlife care is 'don't feed the wildlife,' " van Sommeran says. "Of course this applies to large, potentially hazardous sharks, same as with other wild, potentially dangerous large predators." Almost every show on Discovery Channel this week has involved tossing hunks of meat or fish to sharks — activity that van Sommeran says conditions sharks to associate humans with food, creating a potentially dangerous interface at swimming and snorkeling sites. Other programs on Shark Week depict researchers catching sharks on hook and line and, eventually, wrestling with the fish and trying to place tags in their hide. "The science-fiction stuff [on Shark Week] doesn't help sharks in the least, and the science is all too often speculative and contrived. Moreover, it often involves injuring the sharks needlessly," van Sommeran says. Peter Knights, of the environmental group WildAid, told NPR last week that Shark Week does much more to harm sharks than it does to help them, largely by portraying them as man-eaters — a reputation that conservationists and educators have been trying earnestly to dispel for years. Shark Week, they say, isn't helping. Viewers of 2014 Shark Week have watched programs with titles like Alien Sharks, Zombie Sharks, Sharkageddon, Great White Serial Killer and Sharkpocalypse, and Americans are devouring it. Last year, Shark Week set viewership records. This year, even more people watched. To be fair, there is some amazing visual candy to be found on TV and at the Shark Week website this week — like the frightening footage from the Woods Hole Oceanographic Institution's SharkCam of great white sharks in Mexico attacking their sturdy metal submersible. But in at least one attack sequence recorded by the submerged cameras, a shower of shattered tooth fragments falls from a shark's mouth. "It's not a dire injury to the shark, and teeth grow back, but those teeth will be out of commission for a few weeks," van Sommeran says, pointing out that the camera could have been padded to protect the sharks' teeth. In Alien Sharks, we meet a young grad student whose job, we're told, is rescuing accidentally caught sharks from a commercial fishing boat's trawl nets. However, skeptical viewers may have noticed that the fishermen caught almost nothing but strange deep-water sharks and might reasonably wonder if they were targeting these "aliens" for the benefit of Shark Week cameras. On Wednesday night, Lair of the Mega Shark featured the hunt for a whale-size great white that has supposedly haunted the waters around Stewart Island, at New Zealand's southern tip, for decades or centuries. When the narrator said that fishermen in the area "consider themselves lucky" to return home alive each evening, I lost my patience. I muted the TV and held my nose. Alastair Bland also wrote for NPR last week on the phenomenon of Shark Week and its effect on demand for shark meat in restaurants.